God’s original intention for sexuality is written into the very pattern of our male and female bodies. We could think of this intention as a word or logos that the Creator speaks into our nature, but it is more than that, too: it is also our first acknowledgment of, and answer to, this divine speech in turn. Though truly ours, this initial response is assured to us before we can will it consciously; indeed, it is given to us as the internal ground and direction sustaining and orienting all our volition from within. To obey this direction is not to become a de-personalized instrument of sub-human forces, but to receive the right form of self-possession, which is itself the condition and the fruit of the vice-regal dominion over nature included in God’s original gift to mankind: “And God blessed them and said ‘Be fruitful and multiply and fill the earth and have dominion over it’” (Gn 1:28). * Non seulement à la mémoire, mais à l’intention de notre ami et de notre frère Stratford; et à l’intention de son épouse, notre amie et notre sœur Léonie. 1. To be sure, the conjugal bond requires the consent of the spouses, but, once their consent is given, it belongs to God. He gathers up the subjective “Yes” of man and wife into an objective form that encompasses the entirety of their shared lives. 2. 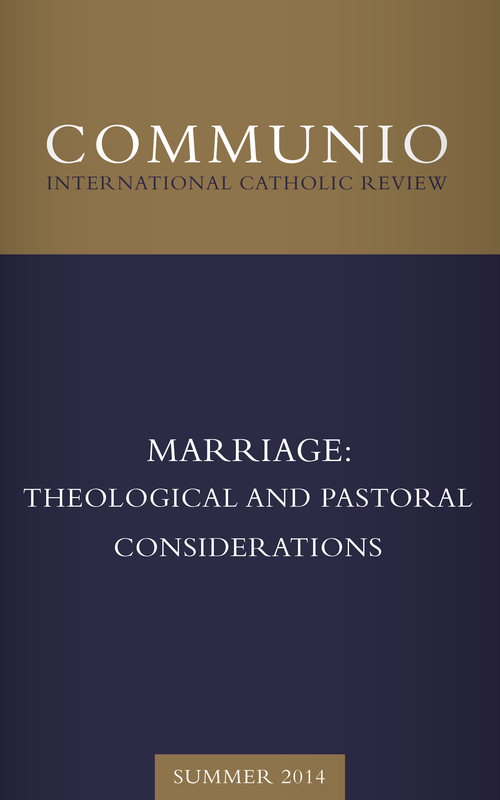 “[C]onsilium Dei de matrimonio ac familia” (Familiaris consortio, 3). This and all other translations mine.